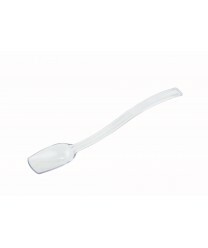 Made of durable polycarbonate and dishwasher safe, the Winco PSSB-10C Clear Salad / Buffet Spoon, 3/4 oz. is also NSF listed, making it a perfect choice for serving food on the buffet line. With an attractive clear plastic veneer, this buffet spoon can match any serving dish and blend in seamlessly with any decor.